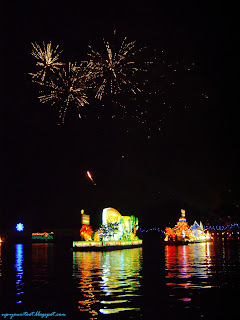 Here are some pictures from Floria 2012's decorated floats (boats actually) and fireworks display. It is worth the time spent standing by the lake for two hours plus to see the 'Magic of the Night' as the organisers calls it. For those who are going to Floria 2012, try to go in the evening and stay on to see this event as many of the Floria exhibits are lighted and look good at night. As each boat goes by the main stage, the MC will give a brief description of the theme for the float plus the thematic music will be played. 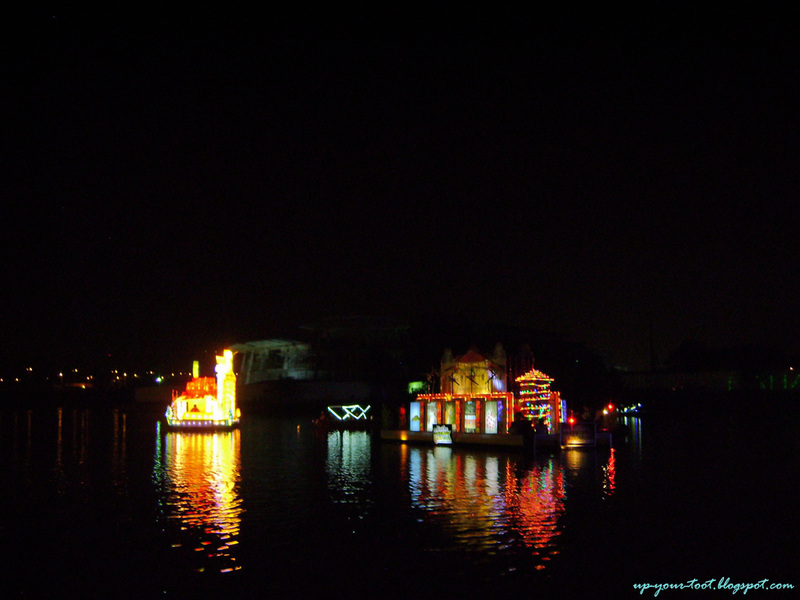 The lighted boats at the end of the parade. 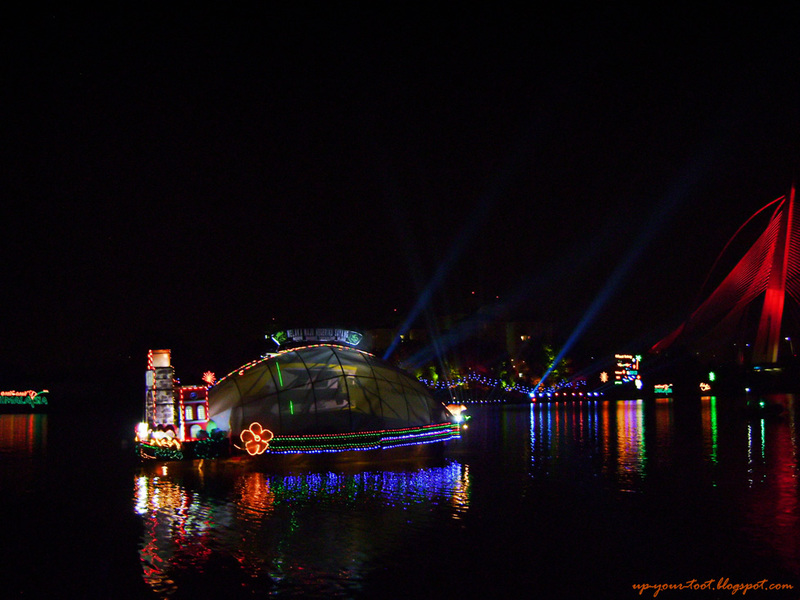 Fireworks display with the boats on the Putrajaya lake. There were two international floats for this event. 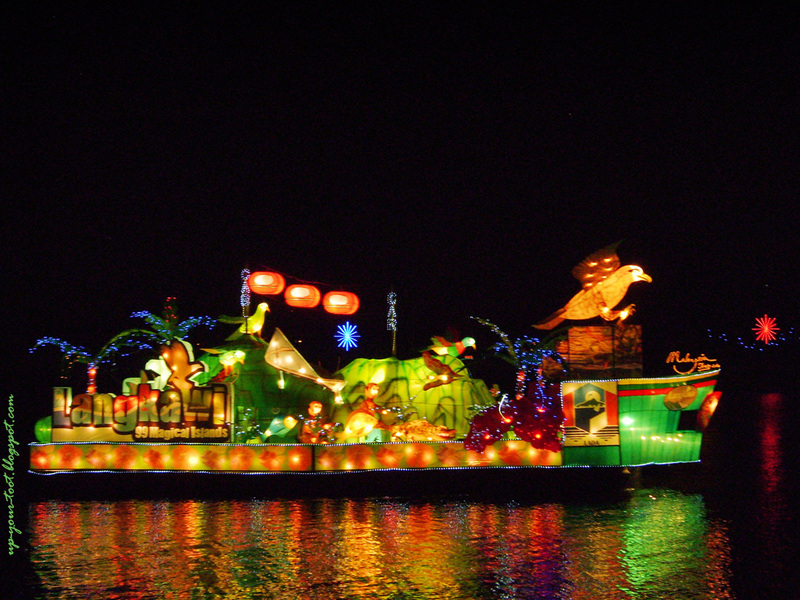 The first international float (and the first float) to drift by is from Suzhou, China. 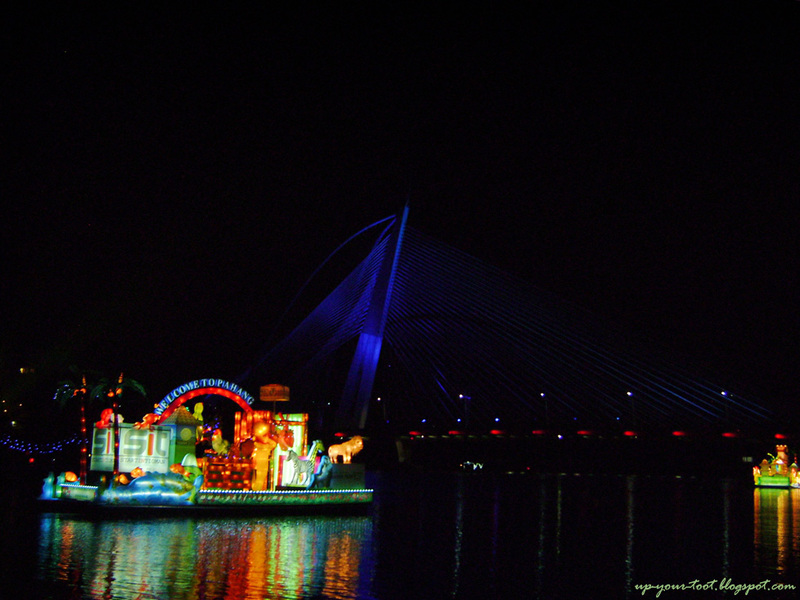 The float from Suzhou highlighted the city as a UNESCO heritage city. Suzhou is also known as the Venice of the East. I think it is one of the best float for the night, if not the best. 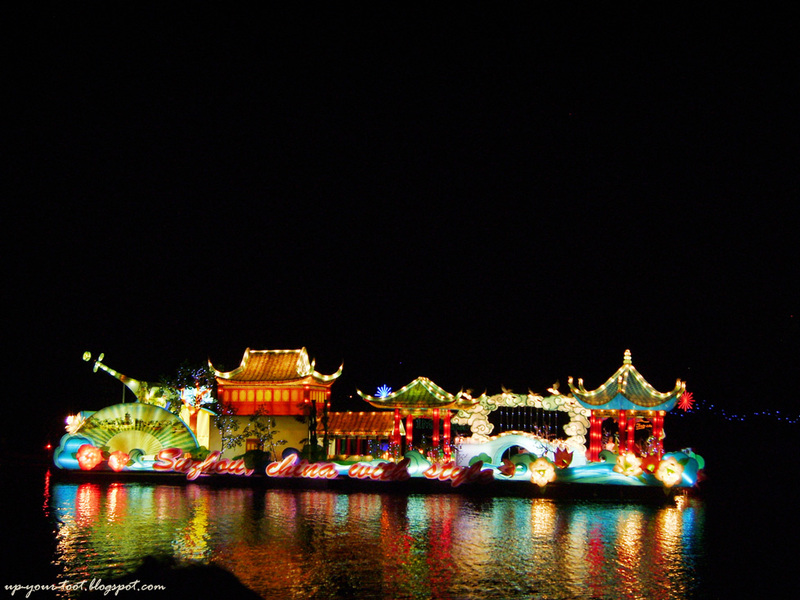 The float from Suzhou, China. The next international entry is from Kenya. Depicted on the float are the Big 5 of Africa, namely the lion, African elephant, rhinoceros, Cape buffalo and leopard. 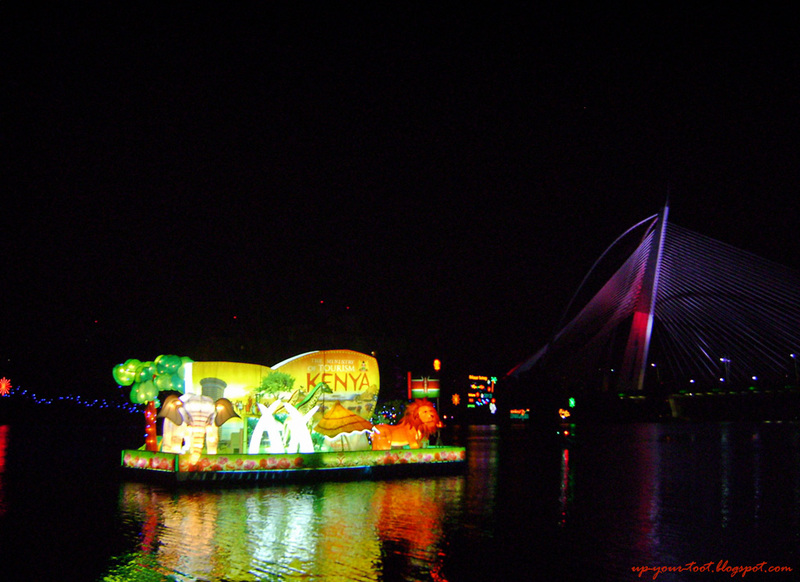 The float from Kenya, depicting the Big 5 of Africa with the Putrajaya Seri Wawasan Bridge in the background. The first local float is from Langkawi. With a large Brahminy Kite perched on the front side of the boat, the float promotes Langkawi's Magical 99 Islands. Langkawi's float with a large Brahminy Kite at the bow end of the boat. Langkawi is named after the Brahminy Kite - Lang means a raptor and Kawi is the ochre colour/dye, the main plumage colouration of the Brahminy Kite. Next is the float from Johor, which is less gaudy but still colourful. I kinda like the colourful checkerboard pattern on the boat. 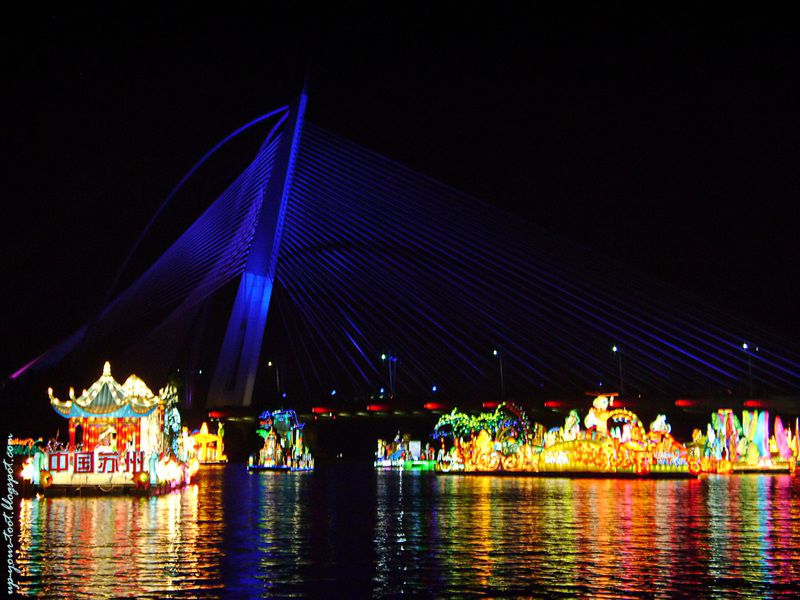 The float from Johor that proudly carries the name of Nusajaya. Next was the float from Melaka. The float looked like a tortoise shell, and had a replica of the A-Famosa gate and a red building that looked like the buildings at Stadhuys at the back of the float. The 'shell' is used as a projection screen for pictures of historical buildings in Melaka plus some laser lights. Not at all attractive as the projected images were not bright enough and the laser light show was nothing spectacular. A possible candidate for the worst float, in my humble opinion. 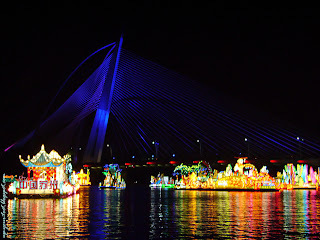 The strange float from Melaka. Rather dark and not eye-catching. The bridge and the lights in the background looked more interesting. After the dull, rather boring float from Melaka, the next float from Negeri Sembilan looked bright and cheery like the Sun. One can easily see that the focal point of this float is a representation of the beautiful old Istana Seri Menanti at Kuala Pilah. The float from Negeri Sembilan depicting the traditional Malay style architecture of old Istana Seri Menanti. This is then followed by the float from the state of Pahang. The float loudly proclaims Start in Tioman (SIT), which is a joint program between the Ministry of Tourism Malaysia, Tourism Malaysia, the Pahang State Government, and the Divers Association. There is also a strawberry onboard, for Cameron Highlands is in the state of Pahang. The float from Pahang, heading towards the main stage. The float from Perak - this is before they turn all the lights off and release pigeons into the night! Tsk tsk tsk, bad float bad organisers. Wah untunglah. 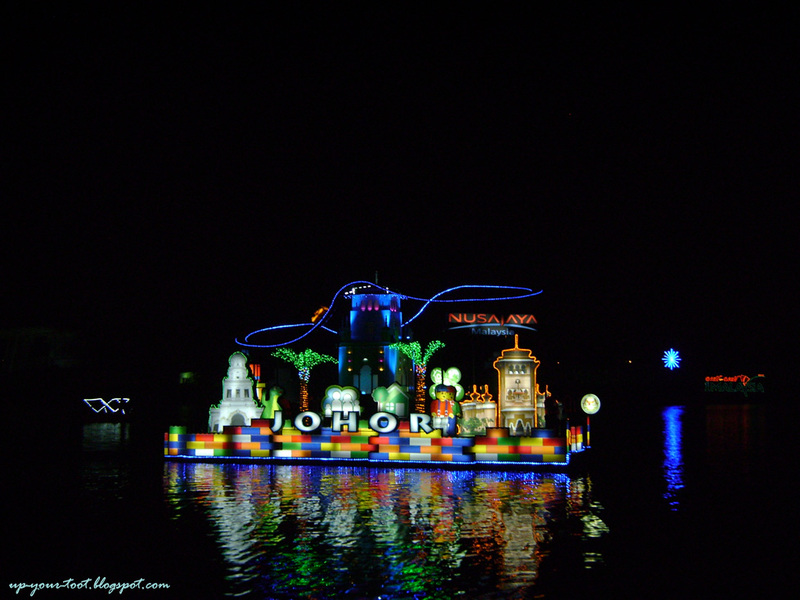 Never seen boat parade except at DisneySea. Tsk tsk tsk...the Perak float sure sounds like a big disaster...poor pigeons. The designer did not complete his homework. Melaka was a bit disappointment too, was wondering what the big looking dome doing there. Yeah, the dome was funny and the images projected was not very clear. I got 8 more boats to add. Sabah, Terengganu and Putrajaya fielded good floats. There was fireworks at the beginning and also at the end of the parade on the first day. 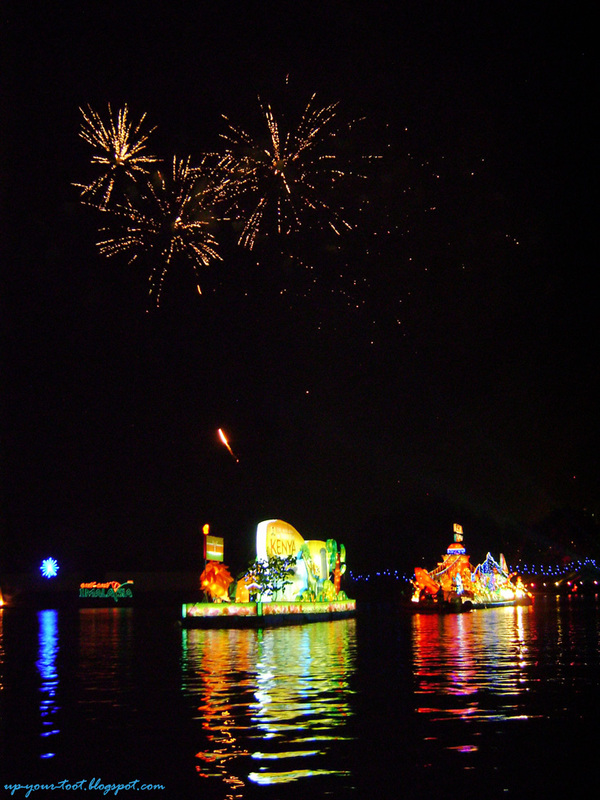 Yes, the float and fireworks are on every night until the 8th July. Do go and have a look. 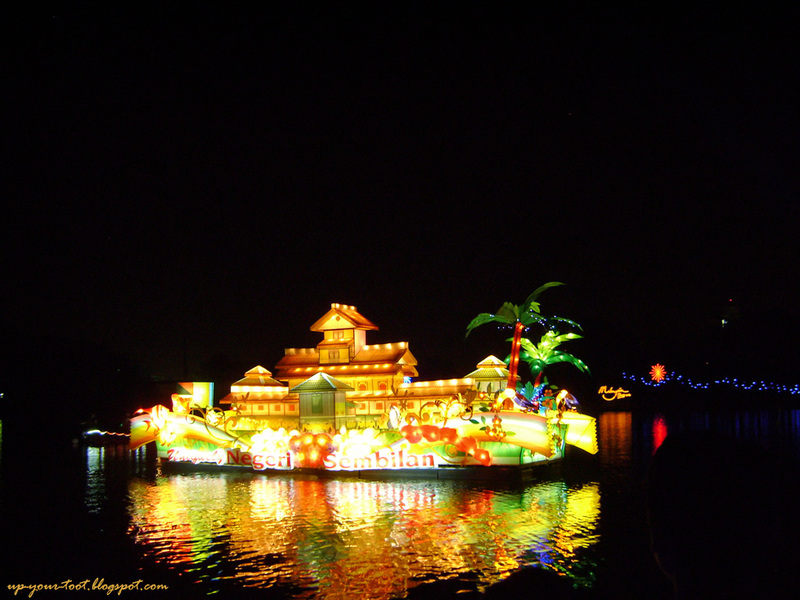 I like the float from Suzhou China and I think it is the best. So sad my photos of it were spoilt. I too think that the Perak float is done in bad taste. I didn't like it. I didn't know they released pigeons. I was wondering why they didn't on the lights! Oh yes, the boat from Suzhou really got the crowd going. I took a lot of shots just in case. 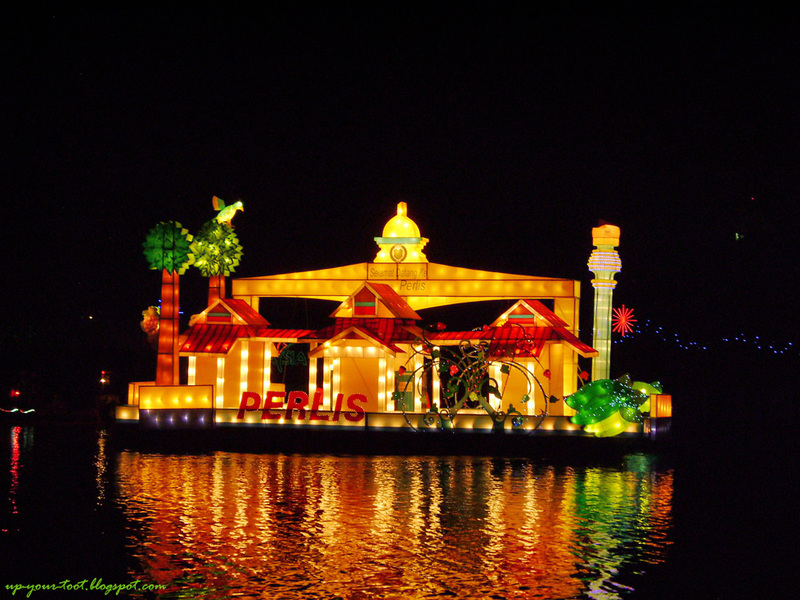 I was surprised when the lights went off the Perak float, then saw the birds flying off and diving into the lake. I guess if the lights were on, the pigeons will just dive back to the float, ouch!